(Money Magazine) -- My employer doesn't match my 401(k) contributions and the funds in my plan have high fees that range between 1.6% and 2% a year. 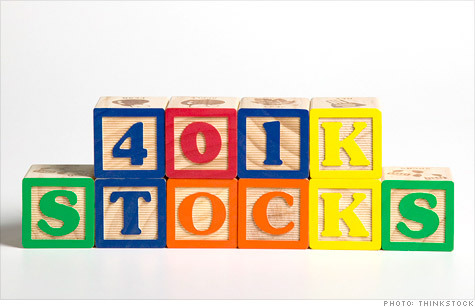 Should I participate in my 401(k) or contribute to an IRA? -- Carlos P., Philadelphia, Pa.
You should almost certainly contribute to an IRA. But that doesn't necessarily mean you ought to avoid your 401(k) altogether. I realize that sounds like I'm waffling, but I'm not. Here's the skinny. The convenience of payroll deductions and the tax benefits of a 401(k) usually make it worthwhile to participate in your company plan even if you don't get matching funds and the investment options aren't the most economical. But in your case, the fees are so high -- two to three times the average for 401(k) stock funds, according to a recent Investment Company Institute study -- that I'd say investing in an IRA first is a no-brainer, provided you'll actually fund it each year. For example, by stashing $5,000 annually in a deductible IRA that is invested in funds that charge 0.5% a year rather than the same amount in a 401(k) with no match and funds that average 1.6% a year, you would end up with an extra $25,000 or so before taxes after 20 years, assuming a 7% annual return before expenses. Clearly, the IRA is the better choice. Of course, this assumes you qualify for a deductible IRA. But even if you don't, you should still be able to contribute to a Roth IRA, either directly or indirectly by opening a nondeductible IRA and converting it to a Roth IRA. And as long as you're not certain to drop into a significantly lower tax bracket in retirement, a low-cost Roth IRA is also a better choice than your high-fee 401(k). But what if building a nest egg large enough to support you in retirement requires that you save more than the $5,000 annual maximum ($6,000 if you're 50 or older) you can put in an IRA? What if you must set aside, say, another $5,000 a year? You can't contribute more to an IRA; you've already hit the annual maximum. So are you better off investing the extra $5,000 in your 401(k) despite the blimpish fees, to get the tax benefits? Or should you forego the tax benefits and take advantage of lower costs available in a taxable account? There's no sure answer since any analysis involves several factors that are difficult to predict: the tax rate you'll pay each year during your career, the rate you'll face when you eventually withdraw funds from your 401(k) and how much you'll pay in taxes on the investments in the taxable account. You can come up with scenarios in which either of the alternatives comes out ahead. Generally though, unless you're prepared to be extremely cost- and tax-conscious about investing in the taxable account --by choosing low-cost index or tax-managed funds and keeping trading to a minimum to avoid generating taxable distributions -- you're probably better off putting any money beyond your IRA contribution into your 401(k), even with its high fees. Otherwise, the annual tax you'll pay on gains in the taxable account will likely wipe out any advantage from lower fees. If you do decide to invest in your 401(k), you may be able to make the best of a bad situation by avoiding funds on the plan's menu that have the heftiest charges and focusing on those that aren't as overpriced. So, if the fees on small-cap funds in your 401(k) are more reasonable than those on, say, the large-cap choices, use your 401(k) funds to get as much of your small-company exposure as possible. Then emphasize large-cap funds in your IRA. That said, don't go with a lower-cost option if you believe that, apart from its fees, it's an inferior investment. Ideally, bloated expenses will eventually become a thing of the past once the Department of Labor's long-awaited 401(k) fee disclosure rules kick in later this year, assuming the agency doesn't postpone them again. But until your 401(k) fees actually decline, max out that IRA first. If you can save more, go with a taxable account only if you're sure you'll stick to low-cost tax-efficient investments and hold them for the long-term. Otherwise, hold your nose and put the extra money in your 401(k). MONEY magazine is celebrating people, both famous and unsung, who have done extraordinary work to improve others' financial well-being. Send an email to nominate your Money Hero.